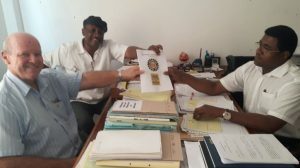 Victoria, Mahe (Seychelles) – November 2, 2017 (travelindex.com) – The Official needed documents for the registration of the new Seychelles Labor Union (SLU) was today received today the 30th October by Mr Bernard Adonis the Registrar of Trade Unions in his Market Street Offices. Alain St.Ange, the President of the new Workers Body and Peter Sinon, the Secretary General were accompanied at this important step for the new Workers Union by Herve Anthony, the Vice President and Marie France Marie, the Secretary of the Union as well as Emanuele De Stefani and Gerry Sopha, both Executive Committee Members of the Union. Mr Adonis received the documents inclusive of the Constitution of the Union, Minutes of the first Meeting and the Registration Form with the list of elected Office Bearers. “Today we moved forward with the final step with the formation of a Trade Union for all working Seychellois. This is a fundamental right afforded by our Constitution and our right to freedom of peaceful assembly and association under Article 23 thereof. The Seychelles Labor Union (SLU) will be standing will all who are working and this includes the salaried employees as well as the self-employed businessmen and women of the islands. At the end of the day, everyone working are therefore workers, and they need a politically independent body to be by their sides and to uphold their rights” said Alain St.Ange, the President of the new Seychelles Labor Union (SLU). Peter Sinon, the Secretary General of the Seychelles Labor Union (SLU) ion his part said that the new Seychelles Labor Union is already having opposition for their determination. “This is a sign of being effective. If there’s opposition, it means they are noticing change is taking place” said Peter Sinon who personally stood with the Nurses as they marched in Victoria on a couple of weeks ago demanding better working conditions. Leaders of the new workers Union said that they were hopeful that come Budget Time this week the specific call by the Nurses will be heard as well as the points made by fishing boat owners, stevedore workers, teachers, sea-cucumber divers, civil status workers and in general the civil servants in Seychelles. The Offices of the Seychelles Labor Union (SLU) will be at Salamat House in La Poudriere Road and they have also announced that the Victoria Main Office will be supported by three regional offices in Anse Louis, Bel Ombre and Au Cap.